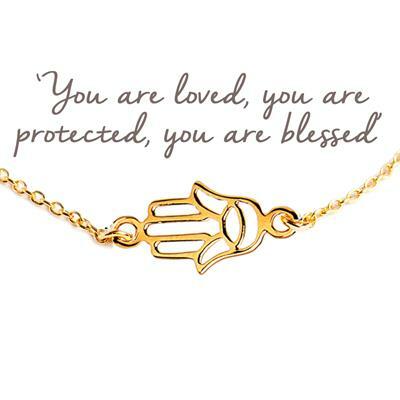 This fabulous bracelet from the Mantra collection features an ornate Hamsa hand on a chain. The Hamsa hand is used in Middle-Eastern cultures to ward off evil spirits and protect the wearer. Wear your Hamsa hand as a daily reminder that you are loved, you are protected and you are blessed. The Mantra collection is inspired by the power of positive affirmations. Wear your Mantra necklace as a reminder of the power of positive thought and let the powerful words heighten your mood and awareness. Mantra jewellery comes packaged in a beautiful box featuring the Mantra logo, a clear area at the back with space for a personal message and sits on an iconic Mantra card. The perfect gift for someone special or a fabulous treat for yourself. What's your Mantra? Made from 925 Sterling Silver with Gold Plating.